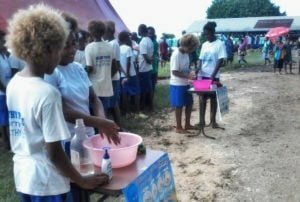 The Arts for Advocacy activities in the WASH in Schools program in New Ireland Province, Papua New Guinea, has empowered students and given them confidence to advocate for improved water, sanitation and hygiene at school. The student WASH Clubs have used global days of celebration such as World Toilet Day, Global Hand Wash Day and World Water Day to conduct hygiene promotion activities and advocate for improved menstrual hygiene management at schools. Private sector partners such as Colgate Palmolive have supported these events through the donation of soap. The Maoim School ‘Germ Wreckers’ club oversees the school sanitation park and ensures that rostered class members keep the toilets clean and ensure there is soap available for all students. Other student WASH Clubs encourage positive hygiene behaviour through innovative promotions, keep the schoolyard tidy and advise other schools. Students are also taking the message of good hygiene home.Felman Benson, a Grade 3 student at Kaselok Primary School, took the WASH messages learnt at school back home and his family built two new toilets, one for his family and the other for his aunt’s family. 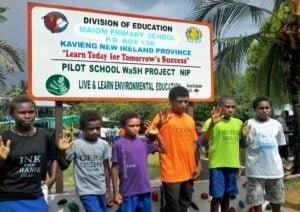 Live & Learn ran a successful four-year Water, Sanitation and Hygiene in Schools program in three Kavieng schools, benefiting over 950 students. The program was part of a broader program delivered with 18,000 students in Papua New Guinea, Solomon Islands, Fiji and Vanuatu with funding from the the Australian Government through the “Western Pacific Sanitation Marketing & Innovation Program” funded by the Civil Society WASH Fund. With the help of Live & Learn schools like Maoim Primary School formed WASH Committees and whole-school student WASH Clubs, which implemented their own ‘club action plans’. Teachers were trained to teach hygiene using fun and interactive techniques with the support of WinS resources such as Arts for Advocacy and Hands Up For Hygiene.